In small bowl, pour boiling water over cracked wheat, stir and let stand 5 minutes. 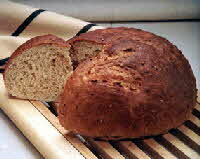 In large mixer bowl, combine softened cracked wheat, 1 cup bread flour, yeast, salt, cottage cheese, honey, oil and egg. Blend at low speed until moistened; beat 3 minutes at medium speed. Stir in whole wheat flour, oats, wheat germ and enough bread flour to make a soft dough. Turn dough out onto lightly floured board; knead 10 minutes or until dough is smooth and elastic. Dough will be slightly sticky. Place in bowl coated with non-stick spray, turn to coat top of bread. Cover; let rise in warm place until doubled, about 1 hour. Punch dough down. Shape into round loaf and place on a baking sheet coated with non-stick spray. Cover and let rise until doubled in size, about 1 hour. Brush loaf with reserved egg white. Bake for 10 minutes; reduce heat to 350°F and bake 30 to 35 minutes or until bread sounds hollow when tapped with fingers. Remove from pan and cool on wire rack. Each 1-ounce slice serving provides approximately: 66 calories, 3 g protein, 12 g carbohydrates, 1 g fiber, 1 g fat (0 g saturated), 6 mg cholesterol, 21 mcg folate, 1 mg iron, 81 mg sodium.